AFTC is the biggest supplier of application materials AFT (Acrylic, Foam, Tape). You can find the products of AFTC everywhere, but they are not visible enough for the outside world. AFTC wanted to show their clients how the applications in their product range could be used, with the help of two interactive brochures. To visualize the applications with the brochures “Marker based” augmented reality was used. One brochure was designed for the automotive sector and one for the construction sector. In the animation that was created for the automotive sector you can see a car that unfolds when it arrives at its destination. As the car unfolds you can instantly see where AFTC double-sided tape is applied in the car. The same method was used for the brochure that was created for the construction sector. When one scans the brochure a building will appear that shows how AFTC is used in this specific sector. Through the AFTC app you can watch the AR presentation. There is also a product wizard integrated in the app that lets the user choose the desired question by answering a serie of questions. 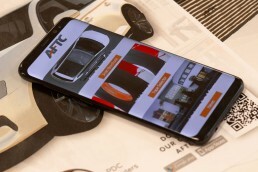 There was also a feature added in the app that displays the newsletter of AFTC. It was a very successful project, with a very happy customer as well.